A show to end all shows. The Mayan calendar predicts the end of the world for 12/21/12. Or wait, did they predict an indigenous uprising of unprecedented scale across Canada? 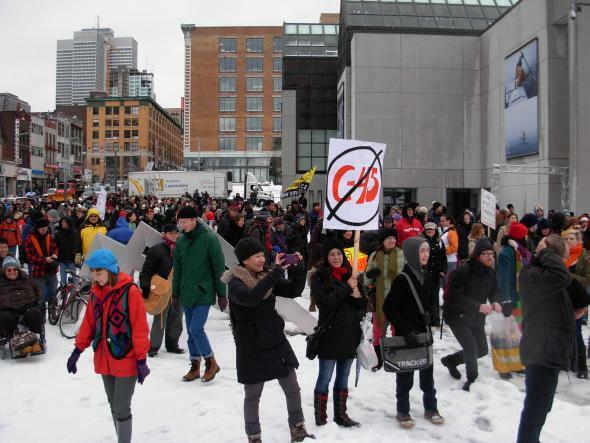 Off the Hour brings coverage from the #IdleNoMore campaign direct from the 12 noon demonstration in Montreal’s Cabot Square. Hundreds gathered in the rain and snow. We spoke with Samian, Ellen Gabriel, organizers and more. #IdleNoMore has brought together indigenous people and their allies from across the country (and internationally) to protest Bill C-45 and a long history of indigenous-Canadian relations from Residential schools to extracting resources on Treaty land. And A Tribe Called Red song dedication to Chief Spence. Policy analyst for the Anishinabek Nation and writer, Jode Kechego joins us from London, ON where #IdleNoMore blocked the 401 highway to describe why and how it all happened. Lastly, Dawn Paley, investigative journalist, brings us a documentary on the Drug War in Guatemala. This was originally created for Free Speech Radio News (fsrn.org).